Why don’t very many small groups in America reproduce themselves? I’ll mention three main reasons, and discuss the third in a bit more detail today. One reason I’ve mentioned often is that many groups simply are not healthy. Healthy things grow, produce fruit, and multiply. Unhealthy things don’t. In my ministry, I’ve prodded, rewarded, celebrated, shamed, urged, and manipulated, but none of these tactics produced multiplying groups to any measurable degree. But when our church focused on health, we saw groups naturally begin to multiply over and over again. Another reason is that many churches and groups simply don’t have the right process, and that process is discipleship. In his blog post this past Tuesday, Eric Geiger, co-author of Simple Church (and his newest book, Transformational Groups), made a great point: “When you design a process for discipleship, view discipleship as the whole process.” When you do, the natural result of discipling people is new leaders who hear God’s call to step up and lead. Simply put, if you want new leaders and new groups, focus on the discipleship process. 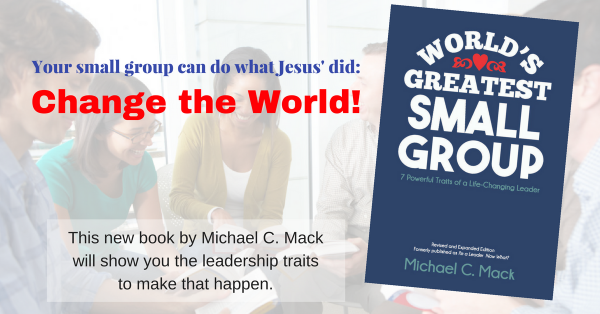 The third reason many small groups do not reproduce has to do with commitment. Many of us are simply not really committed to the mission God has given us as the Body of Christ. The only way we can go and make disciples of all nations is to reproduce ourselves–to multiply … which takes sacrifice on our parts. Group multiplication is one of the most difficult things you’ll do as a group, but it’s also one of the most rewarding. When I talk to people about multiplying their group, almost always their number one excuse goes something like, “That sounds good and all, but it just wouldn’t work for us.” In other words, “It would be uncomfortable for our group. It would require our group to sacrifice and step out of our comfort zone.” But seriously though? Seriously? You are a part of a faith system founded on a cross. How could you not expect self-sacrifice to be a part of this? Are you surprised? Did Jesus not make it pretty clear from the start? I’ve heard the same responses (excuses) from group leaders and members. This is also a frustration for some group leaders who “get it” but can’t convince the members of their groups of their call to reproduce themselves. This is an unfortunate outgrowth of the “holy huddle” syndrome that has infected so many groups and keeps them from Christ’s mission. Consumers make their groups all about themselves. Consumer-centered groups are by nature not Christ-centered groups. That’s why the first Vital Sign of a Healthy Group is that it is Christ-centered. This commitment is foundational for all the rest. And do you want to know what’s really sad? A group that is focused on what they want rather than on Christ’s purposes for them is a group of idol worshipers; the idol being themselves and their own consumer-driven comfort and cares. That may sound harsh. But I sense a call to speak the truth in love. I’m committed to this. If you want to change the culture in your group(s) and in your church, I encourage you to go back to the first two reasons I gave, above. Focus on health and the discipleship process. This, too, is a commitment and will take some surrender and sacrifice. But remember, you are part of a faith system founded on a cross!